That have 2 main trends will be discuss. First one is the trend during years 1996 to 1999. From years 1996 to 1999, it was a period that Thailand created the Asian financial crisis and faced the recession from the crisis until the economy recovered. In 1996, Thailand was facing export stagnation because a decline of demand from First World countries, and also opening domestic markets to outside money brought a deluge of short-term foreign investment and spurred heavy short-term borrowing from abroad, fueling a building boom (http://www.encyclopedia.com/doc/1G2-3406400060.html). Thailand baht was fueled by refugee capital and it was the starting of Asian Financial Crisis (http://www.economist.com/node/9432495). As a result, Thailand GDP was fallen down due to the lost confidence of investors and the stagnation of export, but that was recovered quickly. IMF’s Executive Board approved financial support for Thailand of up to about US$4billion over a 34-month period (IMF staff, June 2000). Thailand government also apply monetary policy to stable the exchange rate and fostering the economy recovery, and fiscal policy to restructuring the economy. In 1998, Thailand GDP returned to positive growth. The second trend is years 2008 to 2010. Thailand was facing political crisis during this period. The anti-Thaskin protesters, known as Yellow Shirts, stage protests for several months since May 2008, and they occupy two airports on November 2008 (CNN news, May 19 2010). The protests activities were continuous until 2010. During years 2008-2010, the Thailand economy being affected that the number of tourism, the number of export and most of the government budget spent on the safety and restoration of damaged by Yellow Shirts. Thailand experienced negative growth of economy after the Asian Financial Crisis. It make many investors and tourism was getting away from Thailand market. In year 2009, the Global Great Recession made double strike on Thailand economy. Japan economy was facing Lost 20 Decades from year 1990 until 2010. Japan was one of the best countries to grow Japan economy in 1980s. This period was also creating high real estate price and soaring Nikkei stock market. The Bank of Japan decide to tighten its monetary policy in year 1989, then soon the Nikkei stock bubble popped and this lead to pop real estate bubble (Jesse Colombo, June 2012). Japan experienced economic stagnation in the following years based on the GDP calculation. The main reasons of prolonged stagnation of Japanese economy in year 1990s was the stagnation of investment and stagnation of household consumption due to the decline of household wealth, stagnation of household disposal income, and the uncertainty about the future (Charles Yuji Horioka, March 2006). Bank of Japan implemented zero interest rate policy in year 1999 to boost the economy but the situation has not improved greatly. Then, Bank of Japan introduced the quantitative easing policy in year 2000 (Yutaka Kurihara, 2014). Quantitative easing policy grab much of attention of investors and the investment start to return to capital of Japan. Japan is ready to recover the economy since the internal growing of Japan is quite high that they consist of lots of information about advanced technologies and higher production of their export area, although Japan was facing high debt-to-GDP ratio which is 225.9% in year 2010. Thailand seem like had a higher GDP growth rate than Japan which may means the Thailand economy is better than Japan. However, Japan experienced Lost 20 Decades during 1990 to 2010. The GDP of Thailand also unable surpass Japan and also the potential growth of nation is lower than Japan too since Japan keep advanced technologies sector even in the period of Lost 20 Decades. For the current period, Japan is recovering their economy after the Lost 20 Decades. Thailand reach two peak of inflation rate in year 1998 and also 2008. In 2 July 1997, Thailand float Thai baht and this lead Thai baht value devalued as much as 20% – a record low (History Squared, 2011). This lead the Asian Financial Crisis, most of the Asian countries were involved in this crisis and led to inflation in year 1998. Most of the Asian countries currencies were fall and led the price level rose in the period. After that, Thailand inflation rate decreased sharply by year 1999, and Thai government lower the interest rate that short-term interest rate fall to 2% in 1999 from 23% in the year 1997 in order hope to boost economy (Economic Reform in Thailand, 2013). The second inflation rate peak was placed on year 2008. It was financial crisis happened on year 2008, the price of oil rose 800% since 2006 until mid-2008 (Clifford Krauss, 2008). This led price of other commodity also increase in the period until the bubble of commodity burst. The combination of an economic crisis and soaring U.S. dollar would cause commodities prices to plunge as in 2008, when commodities prices imploded by nearly half in a mere five month (Jesse Colombo, 2015). It led deflation to Thailand in year 2009 since many commodities prices fall sharply. After the crisis passed, the economy return to supply and demand level. In the period of Lost 20 Decades that Japan experienced, the decreasing rate of inflation was happened in Japan. Japan government keep their effort to prevent deflation during Lost 20 Decades. That had few causes to make Japan suffer in deflation so long time. Surplus in savings, government policy mismanagement, structural impediments, Yen appreciation and global capital flow were considered as the causes that prolonged Japan economy recover period and led to deflation due to the research of Daniel I. Okimoto. In 1997, Japan experienced the peak of inflation rate. It was the Asian currencies crisis period since most of the Asian countries also been affected by devaluation of currencies. In April 1997, Japan government rose the consumption tax rate from 3% to 5%. The economy continued to deteriorate in 1998: the year 1998 recorded negative growth for the first time since 1976 (Takatoshi Ito and Andrew K. Rose, 2006). Japan economy was slowed down that led the people consumption lesser and lesser in Japan. Deflation was continuous until year 2002 that most of the investors believe that Japan passed the Lost Decades period and start to recover Japan economy. Unfortunately, Japan economy stagnation still going on in year 2002 until 2010 that Japan people consumption still low and they save more money in bank as a result of surplus in savings. Inflation rate increased in year 2008 was the result of Global Financial Crisis, which the US housing bubble burst, in the situation almost same as described above in Thailand. The Japan Lost 20 Decades was believed that is past in year 2010 which the GDP growth was positive and inflation rate increase in a safe frequent. Thailand has higher inflation rate growth compared with Japan. Inflation rate is meaning about a country’s growth due to the people could expense more in the period. Japan must face the inflation rate to boost the economy activities to recover the Lost 20 Decades for Japan. As the graph showing, Japan inflation rate was increasing from year 2010 until now, that means Japan has no more stagnation on their economy activities that they could boost the economy back to the standard. In contrast, Thailand was getting decreasing inflation rate from year 2010 to year 2013. Thailand unemployment rate increase due to the investments of foreign countries was shift to Indonesia or Vietnam, cheaper and higher skill labor force, that made Thailand people being poor and slow down their consumption during 2010. "Comparison of GDP and Inflation: Japan and Thailand." UKEssays.com. 11 2018. All Answers Ltd. 04 2019 <https://www.ukessays.com/essays/economics/a-comparison-of-gdp-and-inflation.php?vref=1>. "Comparison of GDP and Inflation: Japan and Thailand." All Answers Ltd. ukessays.com, November 2018. Web. 22 April 2019. <https://www.ukessays.com/essays/economics/a-comparison-of-gdp-and-inflation.php?vref=1>. UKEssays. November 2018. 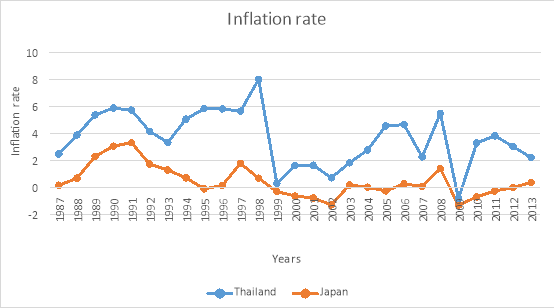 Comparison of GDP and Inflation: Japan and Thailand. [online]. Available from: https://www.ukessays.com/essays/economics/a-comparison-of-gdp-and-inflation.php?vref=1 [Accessed 22 April 2019]. UKEssays. Comparison of GDP and Inflation: Japan and Thailand [Internet]. November 2018. [Accessed 22 April 2019]; Available from: https://www.ukessays.com/essays/economics/a-comparison-of-gdp-and-inflation.php?vref=1.